Juliann Ma pursues a passion for revolutionizing world education and lifestyle practices through the music. Her constant search for new, meaningful ways to communicate with audiences has led her to address global concerns by extending her native language of classical piano through collaborative, cross-cultural, and interdisciplinary projects that she writes, directs, and produces. Her most recent initiative, SEAS (Sustainable Environment Through the Arts and Sciences), performed in collaboration with an expanding team of environmentally minded artists and scientists who bring her research-drawn stories to screen and stage, has earned her the Father Merlet and Marin Alsop Entrepreneurship Awards. Under her direction, they have performed in venues as Carnegie Hall, the Consulate General of France in New York, Louis K. Meisel Gallery, Yamaha Artist Services New York, and released their debut music video ‘Rise, Awaken’ to the public on Youtube. This past July, she was invited by Caroga Lake Inter-Arts Symposium Artistic Director Kyle Price to present SEAS and co-lead an open discussion in collaboration with the filmmakers of Chasing Coral, the documentary, on environmental ethics and the role of performing arts in the face of climate change. This August 24 - September 7, their work will be featured in Heritage Space, Hanoi, Vietnam, in their ‘Art and Technology : Art as Insight’ exhibition, curated by Katherina Nguyen. 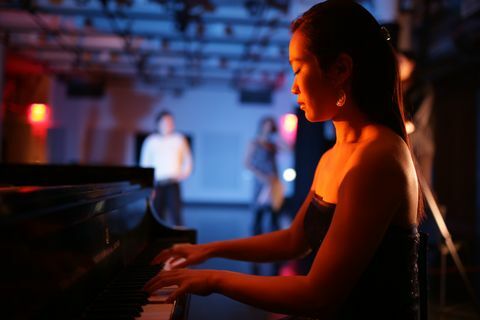 Ms. Ma, winner of the 2016 Pro Musicis International Award, is an avid citizen-artist who has enjoyed diverse teaching, leadership, and enterprise roles as Stanford University Arts Academic Theme Associate, Stanford Pre-Collegiate Summer Institute’s Resident Counselor and Teaching Assistant for Creative Writing, Juilliard Gluck Fellow, and Avenues, The World School music faculty. For the past two years, she was invited to partake as both multidisciplinary performer and stage manager at Silkroad Ensemble’s Global Musician Workshop, as well as Teaching Artist and Speaker at Caroga Lake Inter-Arts Symposium and Music Festival. Currently, she serves as faculty of ToneRow.com, teaching students worldwide online, and maintains a private studio in Manhattan. Juliann Ma completed her studies at Stanford University (B.A. Music, Honors & Distinction, minor in Creative Writing), École normale Supérieure de Musique de Paris Alfred Cortot (Diplôme d’Exécution de Piano, Fulbright grant), Juilliard School (Master of Music), and Mannes, The New School for Music (Professional Studies). For her contributions to Humanities & Creative Arts, Juliann Ma was presented with the Robert M. Golden Medal at her Stanford graduation. Ms. Ma’s performances have taken her across Europe, Jamaica, Japan, and the United States, including prestigious venues as Bing Concert Hall, Konzertsaal Bundesallee, Carnegie Hall, Salle Cortot, Dôme de Grandes Écuries Chantilly, Herbst Theater, Hitachi Systems Hall Sendai, Three Palms Montego Bay, and Schoenberg Center. This August, she will be conducting a tour of solo concerts, SEAS Productions exhibitions and demos, and masterclass series in Southeast Asia. In her spare time, Juliann enjoys filmmaking, photography, dancing, singing, sailing, cooking, designing jewelery, and drawing inspiration from nature and her city. You are invited to attend one of Juliann’s upcoming events, or contact her directly! A varied collection of performances by Juliann Ma. Peanuts Gallery Piano Concerto: an original production animating Charles Schulz’s cartoon characters through the musical genius of Ellen Taaffe Zwilich, along with a few subtle surprises. Interdisciplinary performance inspired by a selection of world music. Mohini (Melody by Sandeep Das, arrangement and performance by TiRaKiTuhTaKa). Video and audio of Juliann’s solo performances, her collaborations, and her projects. Pro Musicis artist Juliann Ma performs in Boston. Pro Musicis Artist Juliann Ma performs 4 concerts in Paris, beginning with Salle Cortot. An experimental temporary exhibi1on exploring intersections of knowledge and art — objects and designs that are beau1ful but also represent amazing technological innova1ons, that inspire reflection and new discoveries for the viewer, art as a powerful conduit of learning. SEAS Productions performances and film screenings will be exclusively hosted at HANOI Exhibition. Romantic composers Schumann and Rachmaninoff are displayed in a delightful morning concert of two pianos, two pianists, four hands. Opening with Robert Schumann’s Carnaval Op. 9, twenty-one short pieces comprise this intriguing exploration of pre-Lenten festival celebrations. The music is daring and delightful, a bright example of his musical gifts. The glory of Rachmaninoff is displayed in the second half of the morning’s concert, beginning with Nine Études-Tableaux Op. 39. They are glorious and rousing, exploding in complex sound that inspires and invigorates, then settling into contemplative exploration that is soothing, yet inspiring. The morning concert closes with Rachmaninoff’s Suite Op. 17 No. 2, a set of pieces composed for two pianos. In each movement, the parts are intricately connected, demanding virtuosity from each pianist. This concert is an exciting adventure into the heart of exquisite Romanticism. Featuring Pianists Juliann Ma and Ilya Kazantsev. Adirondack Reflections Each summer in Caroga Lake, InterArts Symposium seeks to bring together an intimate group of resident artists from various creative backgrounds to explore interdisciplinary connections and collaborations. Resident artists spend a week together in Caroga Lake practicing, performing, experimenting and collaborating on creative projects. During the week, participants have the opportunity to immerse in spirited table discussions, lead a 45 minute presentation of a topic of their choice, take part in special talks with guest speakers, perform educational outreach events and experiment with interdisciplinary art with fellow resident artists and guests. Juliann Ma, Director of SEAS, introduces the first film of the MyHil Film Screenings hosted by Caroga Lake Inter-Arts Symposium: Chasing Coral, directed by Jeff Orlowski and Larissa Rhodes. Strongly inspired by the work of Chasing Coral research and filmmaking team, Juliann’s and SEAS’s mission is to further the reach of these tireless environmentalists through the performing arts, drawing awareness, empathy, and environmental proactivity. With Caroga Lake Inter-Arts Symposium Artistic Director, Kyle Price, Juliann discusses our ethical responsibilities to and the possibilities of encouraging pro-environmental change through the arts. Together with Chasing Coral cast and representative Zackery Rago, Kyle and Juliann will lead an open Q & A with the audience, post-screening. FILM 1: Performance, Talk and Film Screening: Chasing Coral July 10 @ 7:00 pm Boathouse of Caroga Lake, 2090 NY-10 Caroga Lake, NY Free Coral reefs around the world are vanishing at an unprecedented rate. A team of divers, photographers and scientists set out on a thrilling ocean adventure to discover why and to reveal the underwater mystery to the world. Featuring a recorded discussion with CLIAS Artistic Director Kyle Price, SEAS Director Juliann Ma, and Chasing Coral representative Zackery Rago, followed by showing of the film. A MyHil Film Series Screening. The Global Musician Workshop (GMW) is Silkroad’s flagship musician training program. Created by Silkroad Ensemble cellist Mike Block, it is designed to foster a community of globally minded musicians, helping artists to learn from one another’s traditions and incorporate them into their own voices. An all-star artist-faculty, including members of the Silkroad Ensemble and their colleagues, teaches styles of music from across the world, representing a wide range of backgrounds and musical traditions from Afro-Latin to Arabic, Celtic, Malian, and more. GMW is held at DePauw University’s Music School, home of the 21st-Century Musician Initiative. The week-long session includes workshops, community building exercises, band rehearsals, faculty and participant concerts for the local community, and evening conversations about what it means to be a musician in the 21st century. Participants can also apply for an intensive performance experience, which offers deep-dives into select musical cultures and styles. GMW is open to participants over 18 years of age, from any musical background. University and conservatory students, as well as professional performers and teachers with backgrounds in Western classical, jazz, world, or folk styles are encouraged to apply, and we welcome applications in all languages. Concerts by Silkroad GMW faculty and students will be held every night from 7-9 PM at the Gobin Methodist Church from Wednesday through Sunday. Keep your eyes peeled for information about special community engagement lunch-time concerts and evening open mikes hosted by Colleen Bernstein around the neighborhood, as well as the Farmer’s Market Jam that will take place Saturday morning! We at the SEAS project invite you to join us at New York’s Yamaha Artist Services for an interactive concert and open discussion of our responsibilities in the face of a changing climate, and our common aspiration to manage human impact on our environment, and to achieve sustainability. Plastics, Coral, Ice, and Earth bring together leaders from diverse fields including music, dance, film, science, and education to join the audience in an open discussion of of our shared responsibility to better our environment. Given the limited reach of scientific publication, and the polarizing nature of the topic, communicating the subtle gravitas of climate change is notoriously challenging. SEAS attempts instead to communicate this global issue as a visceral, emotional message via its unique collaboration. We distill the scientific argument into an accessible message expressed as a performance, tangibly felt and easily shared. The event will feature live performances of music and choreography inspired by recent environmental observations, including two world premieres: a story of plastics in the ocean, and of disappearing ice. Also featured are musical classics reinterpreted as calls to save coral reefs, seabirds, and address other stresses on our planet. Each performance will be introduced by Jared Brewer (PhD candidate in Atmospheric Science, CSU; NOAA), who will also lead a Q&A session to reinforce, and discuss the goals and messaging of SEAS. SEAS will also present our debut music video, and discuss the storied history of the formation of our artistic collective. The event will be filmed and edited into a mini-documentary, in the hopes that it may inspire action beyond the guests of the the event. Please join us on April 11, at 7pm, and bring an open mind and a desire to do good. Entry is free and open to all, but you are encouraged to support our work via a donation. RSVP asap for guaranteed seats. Donations at various levels enable you to join raffles for coveted prizes - including environmental jewelry, apparel, guaranteed seats for future performances, and more! This event, and our continued collaboration is made possible by generous support from our sponsors. ‘Rise, Awaken’, choreography by SEAS, music by Maurice RAVEL (‘Sad Birds’ 1905) - Deforestation. World Premiere: ‘Plastisphere’ choreography by Angela FALK & Jesse OBREMSKI, music by Hannah SUN (‘The Whales’ 2018) - Plastics in the ocean. World Premiere: ‘Isostasy’ choreographed by Peter FARROW & Thomas WOODMAN, music by Marc EVANS (‘Formations’ 2014) - Calving and melting of ice mass wordwide, rising sea levels. ‘Greef’, choreography by Juliann MA & Amanda KRISCHE, music by Maurice RAVEL (‘A boat on the ocean’ 1905) - Vanishing coral reefs. ‘Hope Reborn’, Igor STRAVINSKY (‘The Firebird Suite’ 1910 arr. Guido AGOSTI) - Environmental stresses on the Earth, devastation, healing, and rebirth. Pro Musicis artist Juliann Ma performs her Carnegie Hall debut recital, attempting to tell the story of humanity’s relationship with nature: the primal joys of discovery by a Faun, destruction of the environment mourned by Sad Birds, rebirth in The Firebird, and transformations in the human psyche as portrayed by Scriabin, Bach, and Thomas Adès. Ms. Ma’s arts collective, SEAS, dances nature’s reaction to climate change in Ravel’s Sad Birds. Featuring the exceptional Miranda Quinn, dancer. This event is open to invited guests only; if you wish to attend, please request an invitation. A larger collection of photography from Juliann’s performances is featured in her photo gallery. Please contact Juliann for a press kit or to arrange press passes for her events. Juliann offers personalized curricula to piano students of all ages and skill levels. Her studio is based in New York City and Cambridge. Please contact her to arrange for lessons or a meet and greet. She also offers lessons remotely via ToneRow. For any professional inquiries including performances, collaboration, instruction, or if you would like to support her work. Juliann has a YouTube channel and a Calendar feed of her public events. If you would like to support Juliann’s work via donation, your gift would go toward furthering her projects! Copyright © 2019 JULIANN MA. All Rights Reserved.